Hello Readers! Wow-- it's been a ridiculously long time since I added fresh content. Please accept my apologies. As if that's not bad enough I'm resuming my updates with content that's already a couple of months old. I apologize for that, too, but this year's Hanami was quite lovely so I don't want to just forget about it. After all, it's still springtime in Tokyo-- here we are now into the third month of beautiful spring weather! This year, Ueno Park was the chosen Hanami spot. There are many, many famous spots to enjoy Hanami in Tokyo, but this is such a personal favourite that it's hard to resist, not to mention it's a reasonably short walk from home. These kitties were super popular with Ueno Park Hanami-goers! Hanami is not just for the daytime! Most places are very pleasant and beautiful at night too! 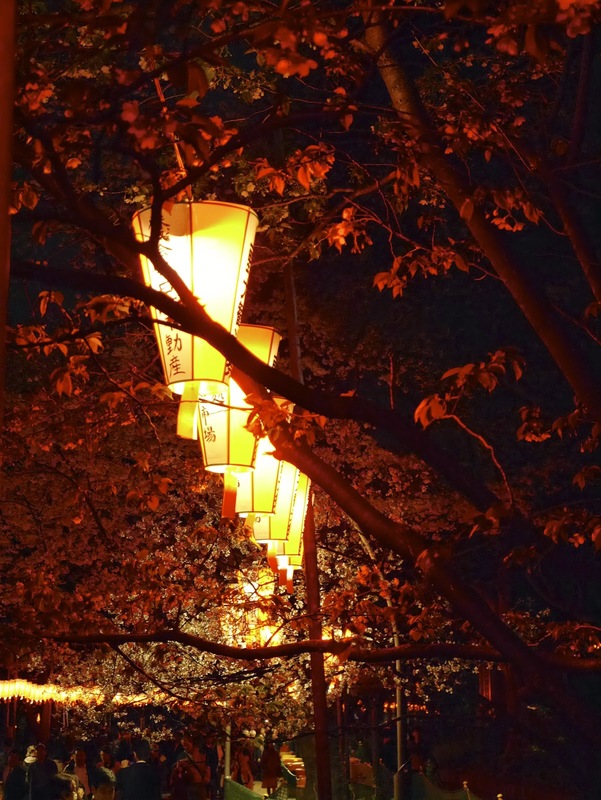 Here's a photo marking the end of this year's Hanami season. This was taken on a rainy day after a blossom was blown onto our veranda from our neighbor's tree (yes we get to see a lovely display of cherry blossoms from our home as well! ).